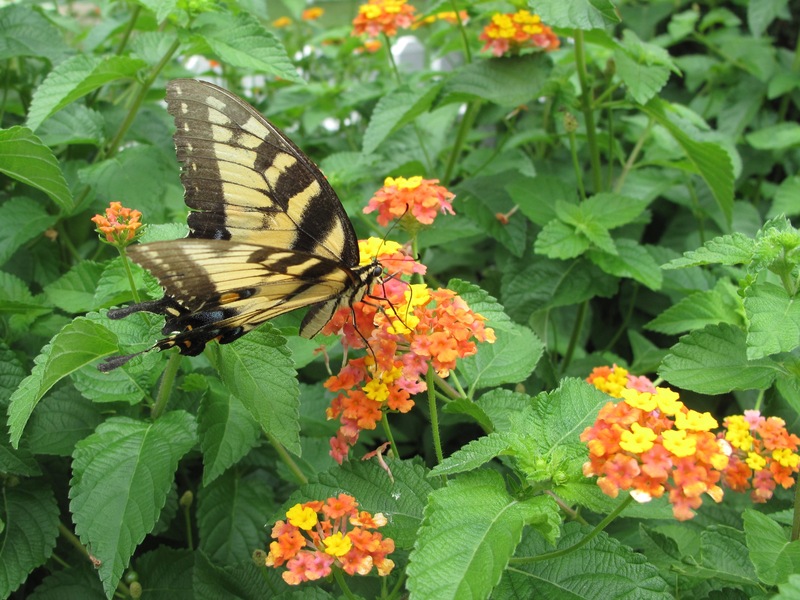 Eastern tiger swallowtail (Papilio glaucous) nectaring on Lantana camara (Common lantana), photographed August 3, 2016. 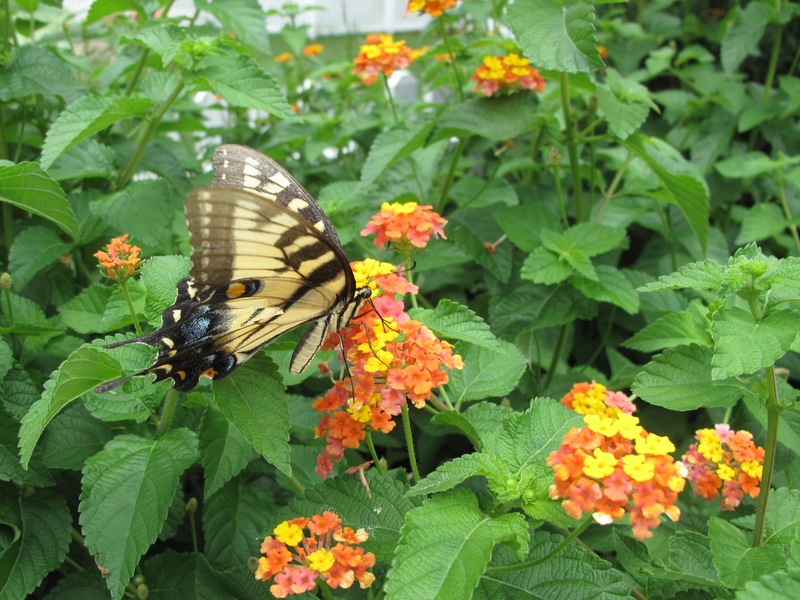 This entry was posted in garden and tagged Eastern Tiger Swallowtail (Papilio glaucus), garden photography, Lantana camara (Common lantana), words on August 10, 2016 by pbmgarden. 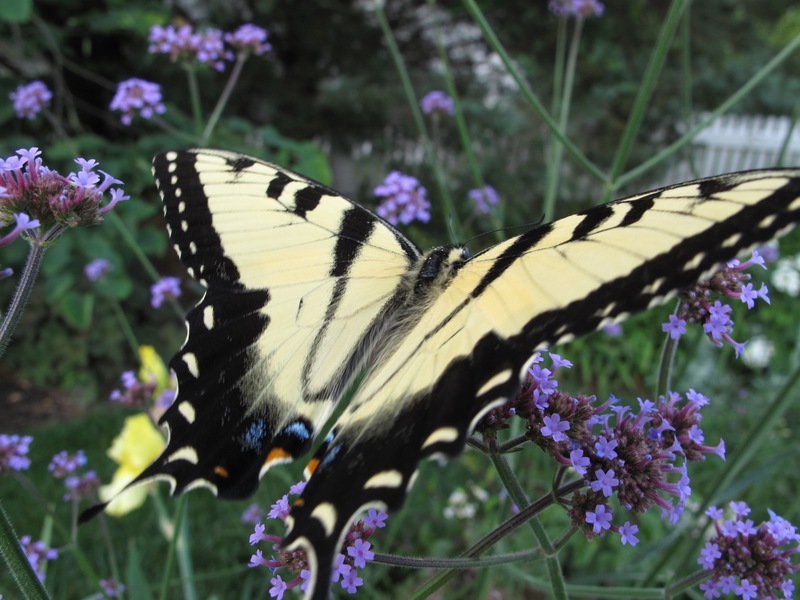 Throughout the day yesterday I glimpsed this male swallowtail nectaring at this large stand of Verbena bonariensis (Tall Verbena). The day before the garden had been filled with colorful American Goldfinch (Carduelis trusts) also enjoying this plant. The verbena has scattered itself all around the borders, so this year I have been able to share some with friends. 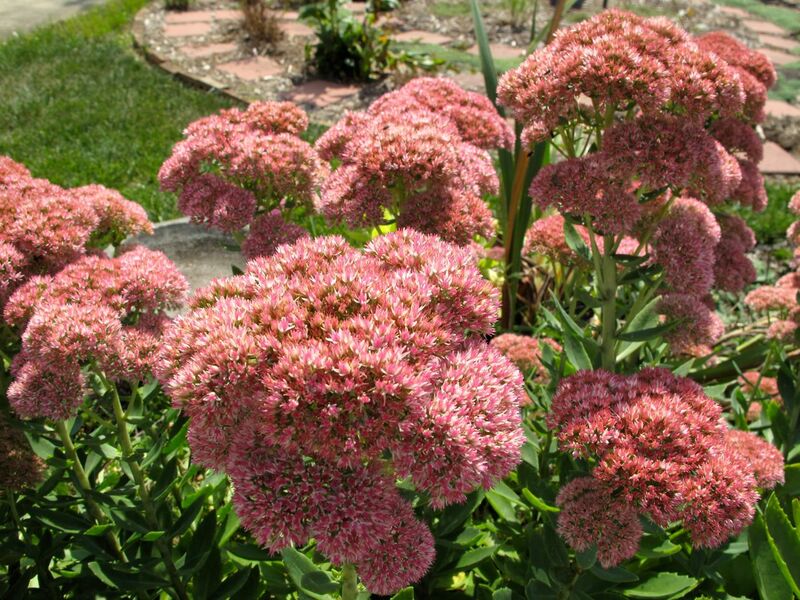 About a month ago I noticed a Monarch butterfly (Danaus plexippus) fluttering around, just for a day, but I could never get a picture. Then again on Saturday another passed through. 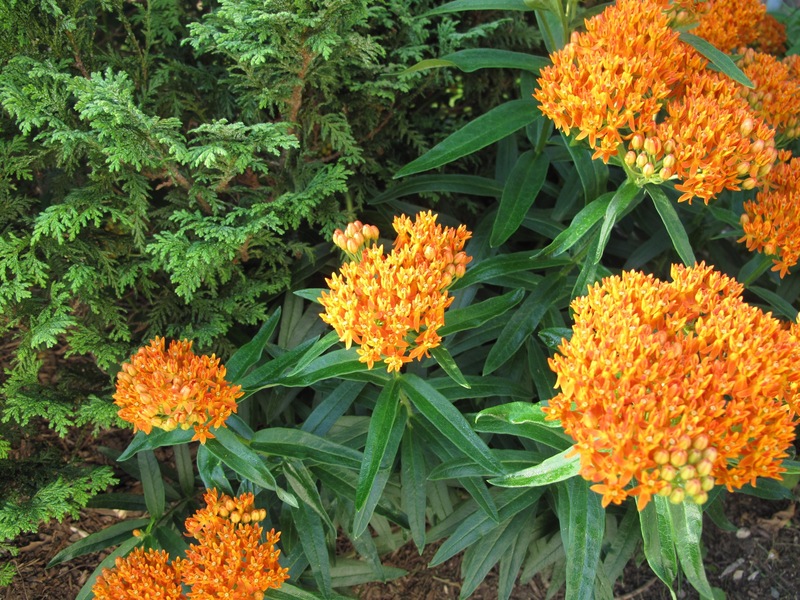 Still no picture of the butterfly, so I will share its host plant, Asclepias tuberosa (Butterfly Plant). 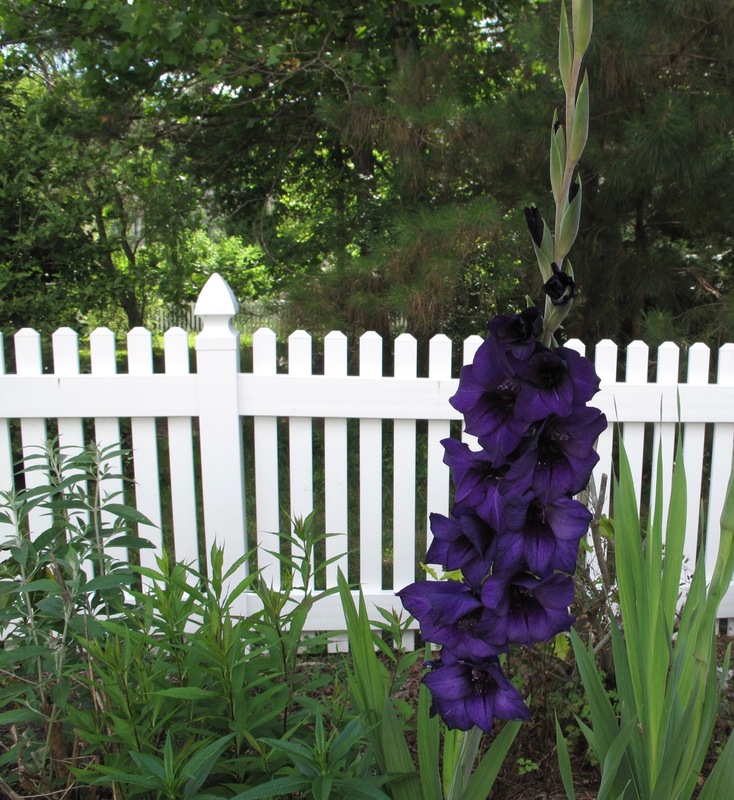 This spectacular gladiolus below is from a package of blue shades mix planted last spring. The bulbs performed poorly last year, so seeing this royal spire each day thrills me. 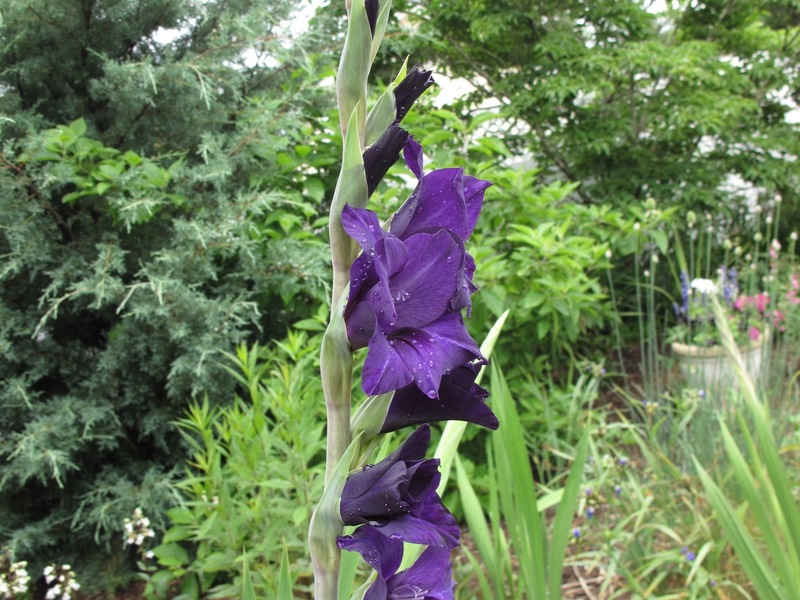 Although the tip of the stem is out of view, at this stage the gladiolus is half blooms and half buds. After Aquilegia canadensis (Eastern red columbine) finished blooming here in the western border, I cut it back leaving this section looking particularly bare. 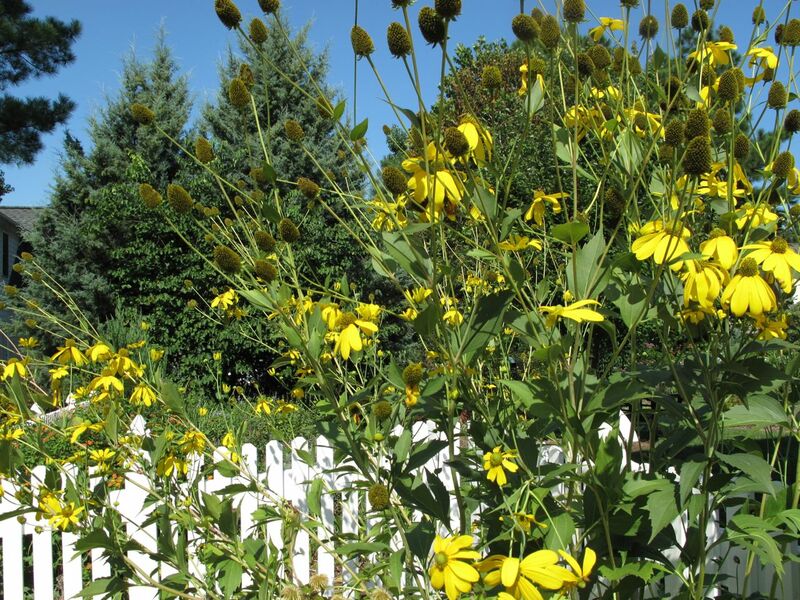 Now that the weather has finally warmed up, everything should fill in quickly: Buddleia davidii ‘Adokeep’ (Butterfly Bush), Helianthus angustifolius (Swamp Sunflower) and Phlox paniculata (Garden Phlox). 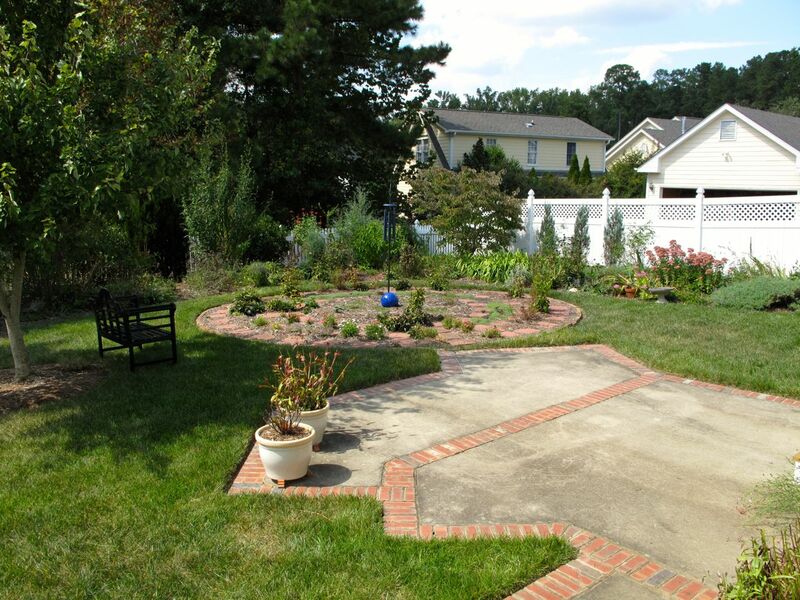 I am still deciding how to replace the gardenia hedge that once lined this fence along the back. This is the same flower after a rain a few days earlier, with the northwest corner in the background: ‘Carolina Sapphire’ (Arizona Cypress), Phlox paniculata (Garden Phlox), Callicarpa americana (American beauty berry), Cornus florida (Flowering Dogwood). In front of the planter Allium atropurpureum are preparing to bloom. 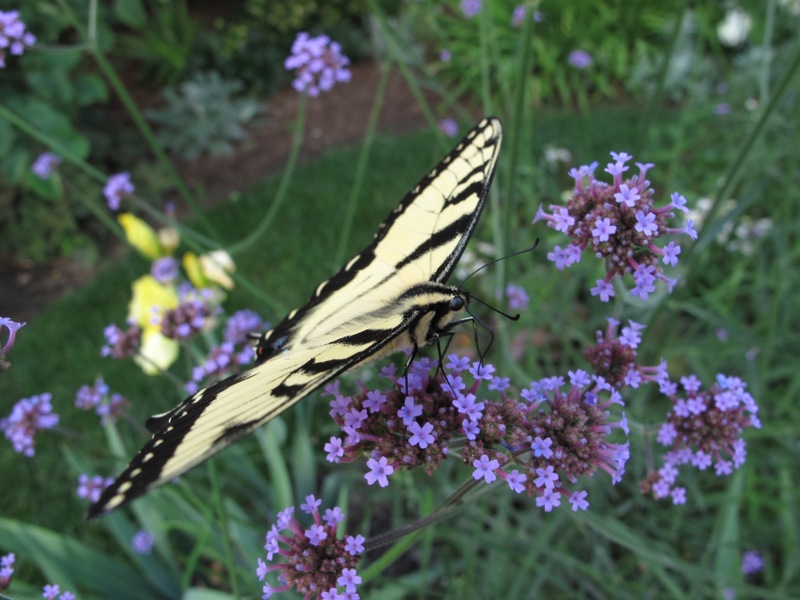 This entry was posted in garden and tagged Eastern Tiger Swallowtail (Papilio glaucus), gladiolus, nature photography, verbena bonariensis on June 1, 2016 by pbmgarden. 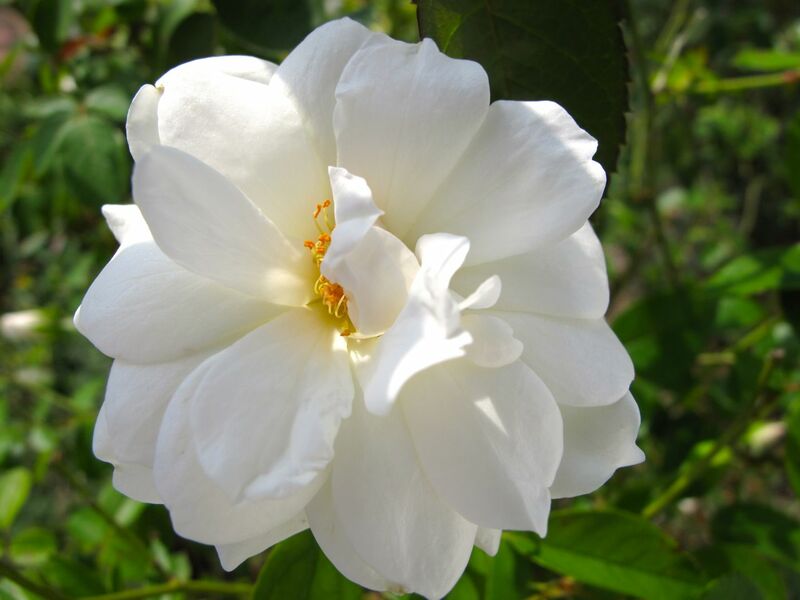 This cheerful Iceberg Rose did better than usual this year due to adequate rains throughout spring and summer. It has begun another round of blossoming recently. 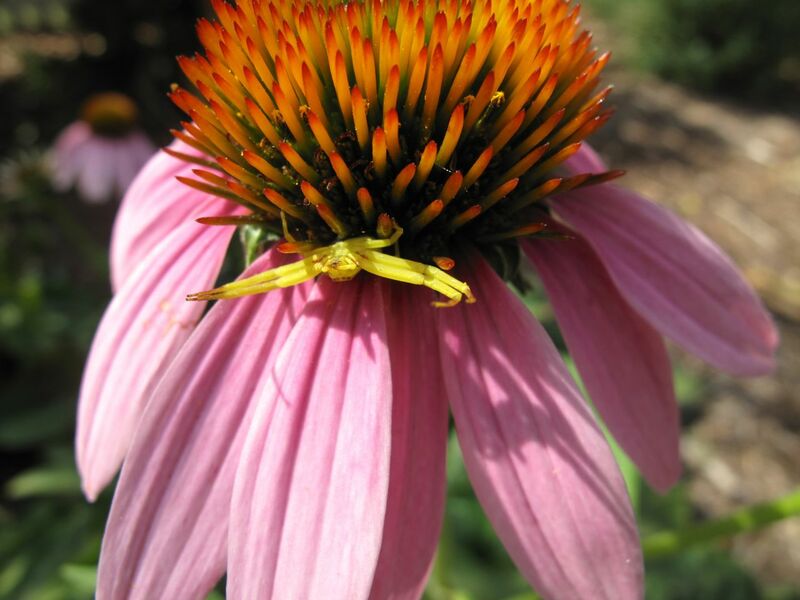 I would like to know what kind of little yellow spider this is hanging out on the Purple Coneflower. The front legs are positioned so it looks like it is trying to hide its face. 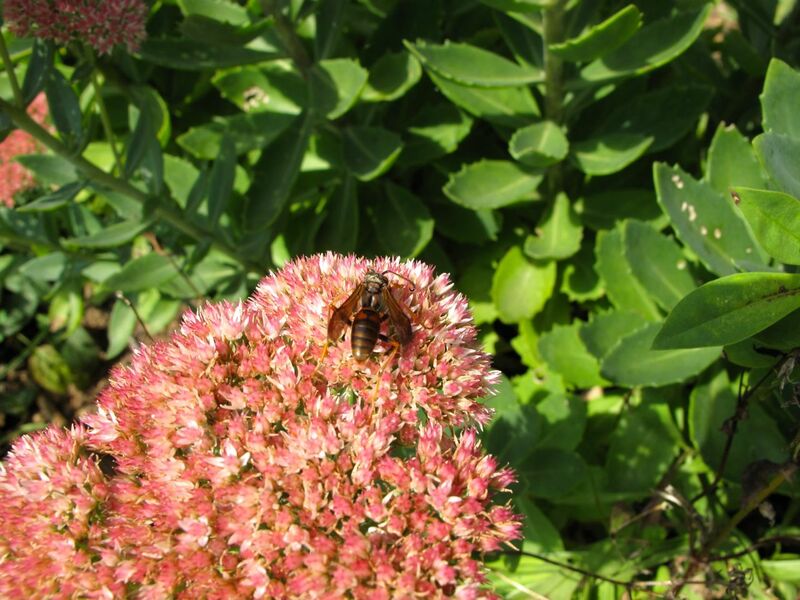 The Autumn Joy Sedum attracted this insect today (a wasp of some kind?) and a few bumble bees as well. 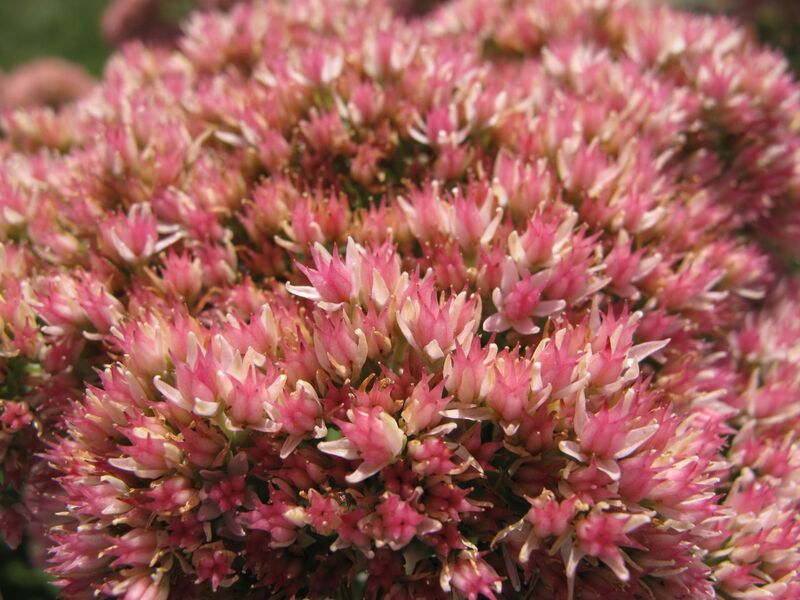 The Sedum’s flowers are deepening from light pink to a darker shade as they age. Meadow Sage has rebloomed now that night temperatures are cooler. 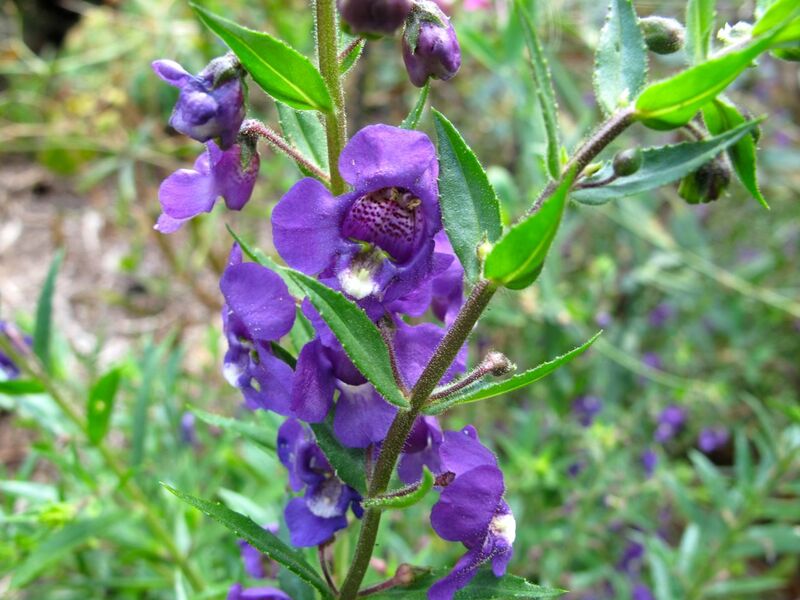 The annual, Angelonia Purple, was a good investment this spring. 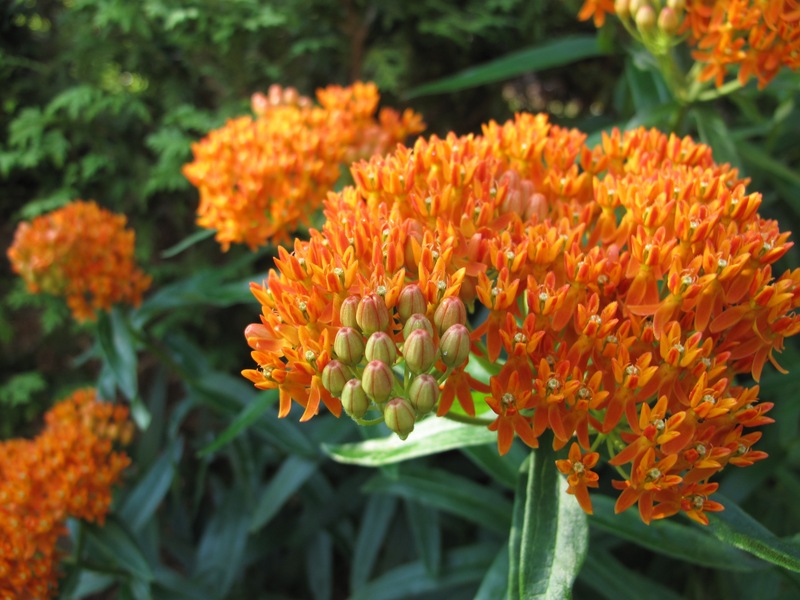 Last year I used it in the meditation circle for color and interest, but it grew too wide. I frequently had to cut it back to maintain clear passage through the labyrinth. 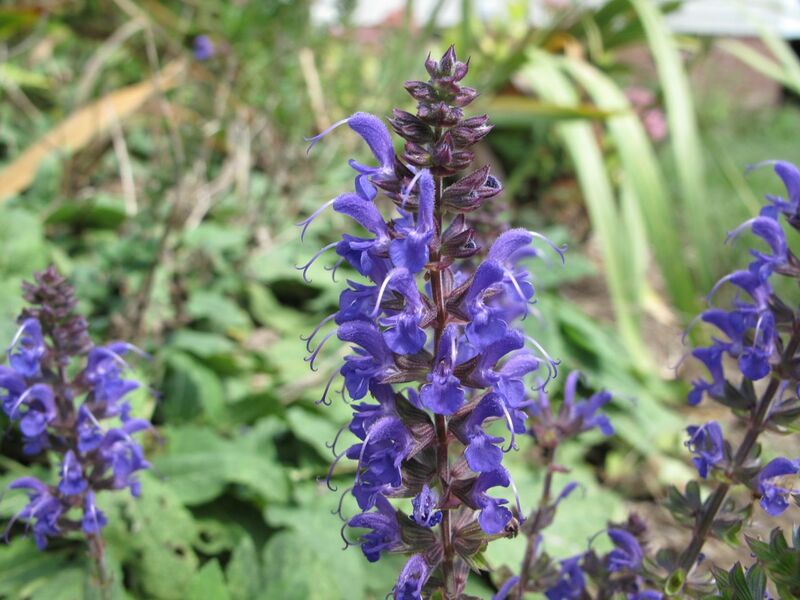 This year I placed Angelonia as filler in a few portions of the border where it had plenty of room. 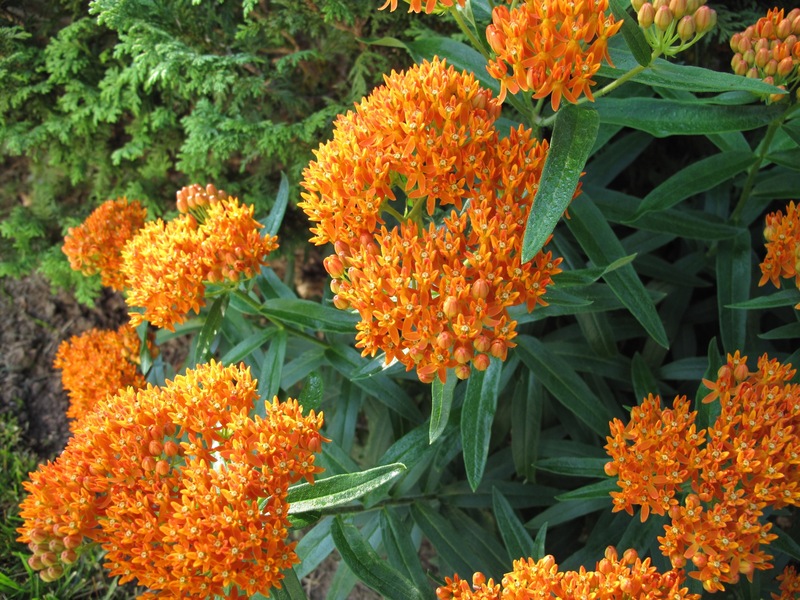 It has bloomed and bloomed and bloomed all summer and will last until frost. 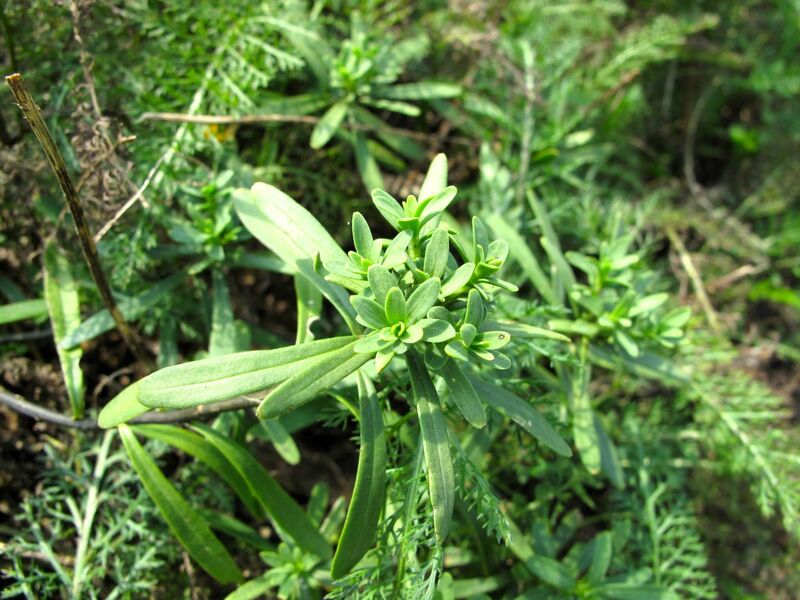 Iberis Sempervirens (Candytuft) died back during the hot summer but is returning with a fresh flush of new growth. 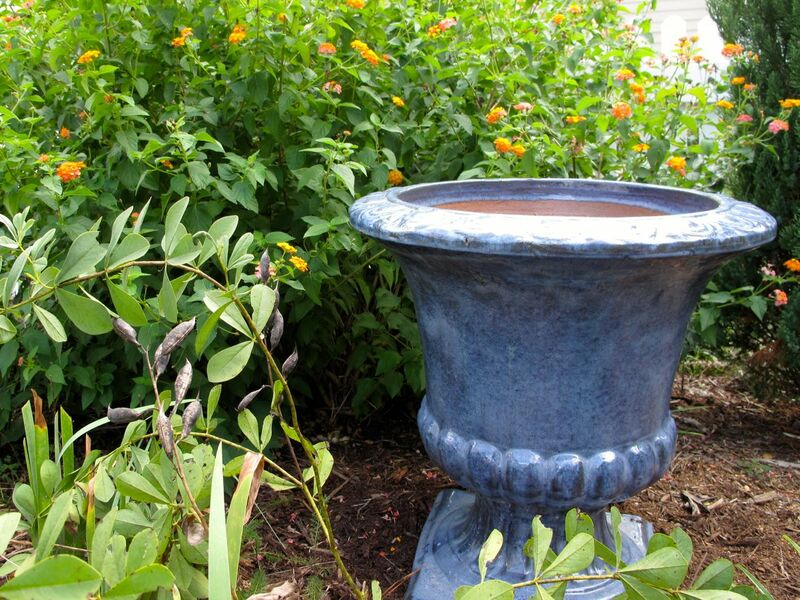 I am excited about a new purchase this week, a grayish-blue glazed ceramic urn to replace the periwinkle jar I had kept in the southern border since spring. 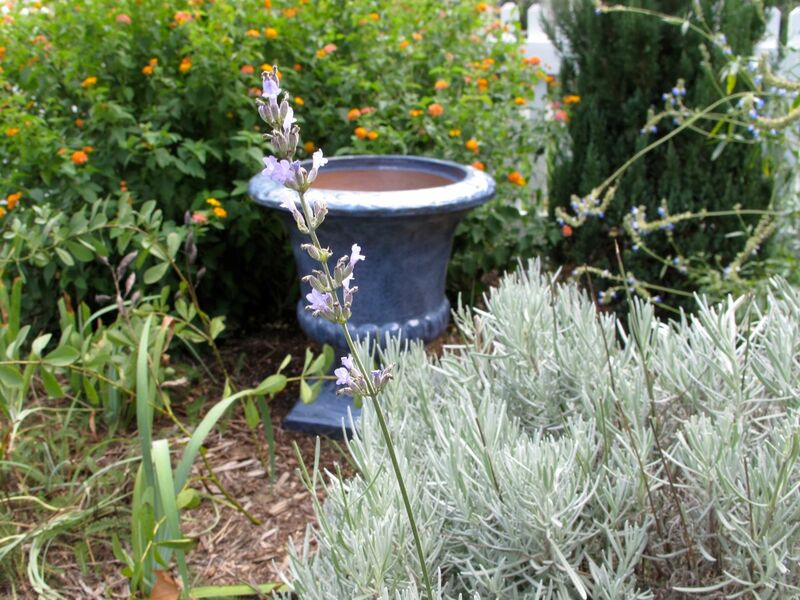 The periwinkle pot will be returned to its indoor setting to keep it safe from the elements. The new urn required two strong men to carry to its current location so I did not get a chance to try it out in a lot of places before setting it down. For now I plan to leave it empty but may add an evergreen form to it later. 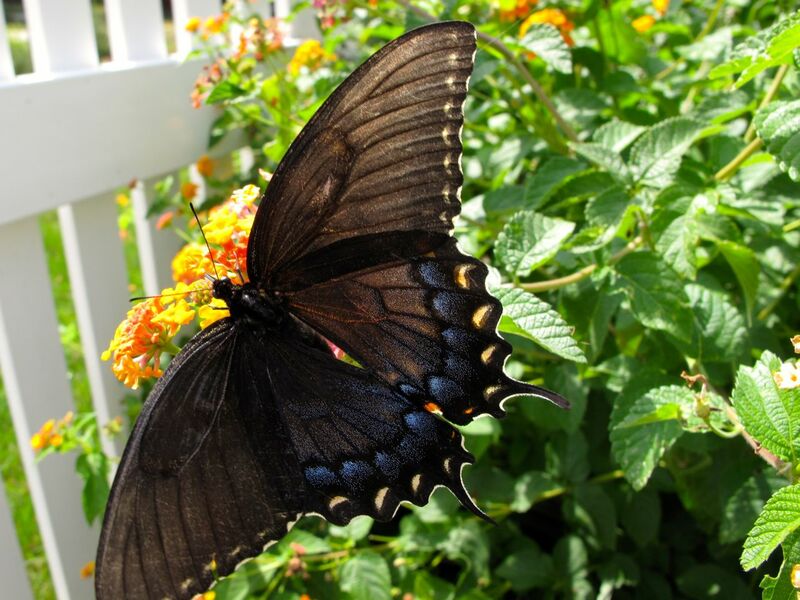 There have been numerous Eastern Tiger Swallowtails gracing the garden this summer, but few have been of this dark female form. 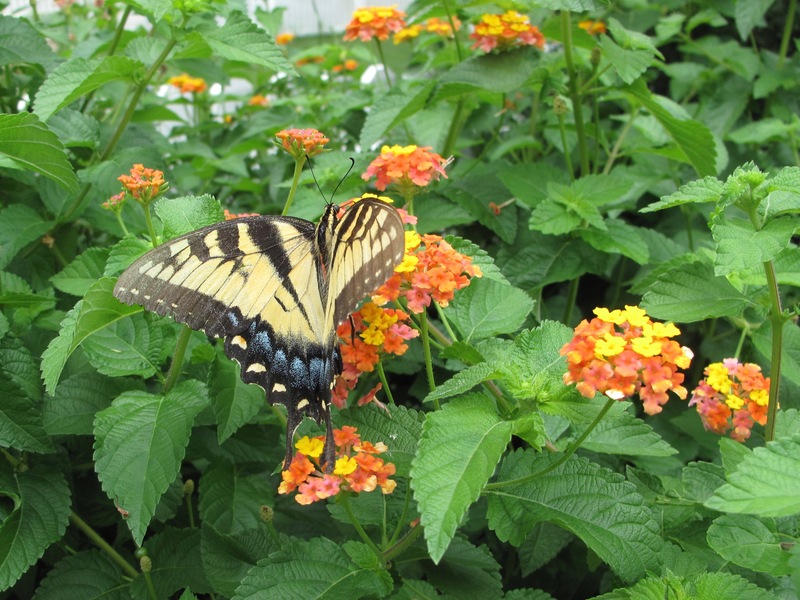 Enjoying Lantana, this is the same butterfly in all the pictures, with color variations standing out depending on the aspect of the view. Sometime during Sunday night or early morning raindrops hit the window and I was awake enough to be grateful, knowing the garden had become very dry. The previous rain was on September 1 and since then, despite cooler temperatures at night, there have been some very hot days. Grass in the front yard has turned crispy brown and the River Birch has given up many leaves. The grass in the back yard where the garden is also has begun dying back in places. By early afternoon when I had a chance to explore the garden there were no visible signs the rain had passed through, but perhaps the plants had already soaked up the nourishment by then. 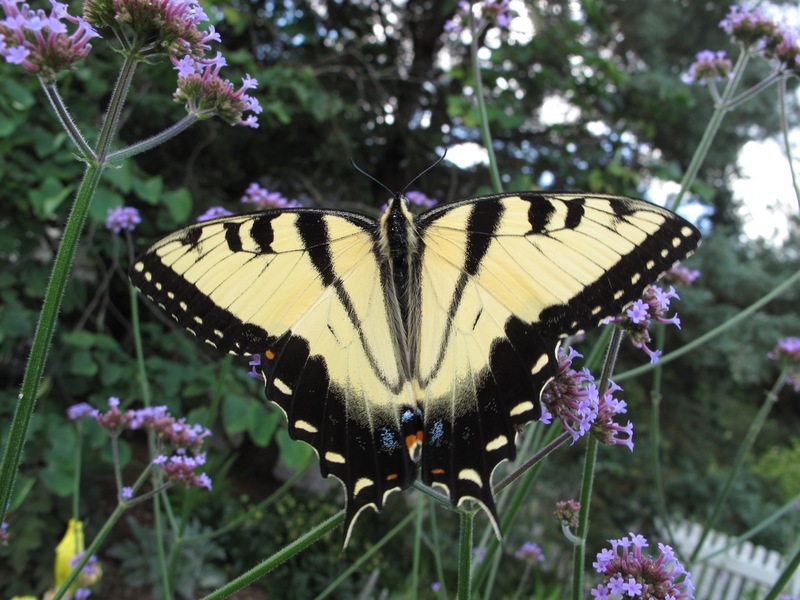 This entry was posted in garden and tagged angelonia, Autumn Joy Sedum, Eastern Tiger Swallowtail (Papilio glaucus), echinacea purpurea, iberis sempervirens, iceberg rose, late summer garden, Meadow Sage ‘May Night’ on September 16, 2013 by pbmgarden. A welcome drop in humidity cleared the haze from the sky and made the early morning air feel refreshingly cool. We watched sections of the borders emerge from morning shadows as we lingered over coffee on the screened porch that overlooks the garden. Sunlight entering the garden spaces framed colorful vignettes. Wind chimes in the meditation circle repeatedly picked up the gentle breeze, echoing sweet tones. 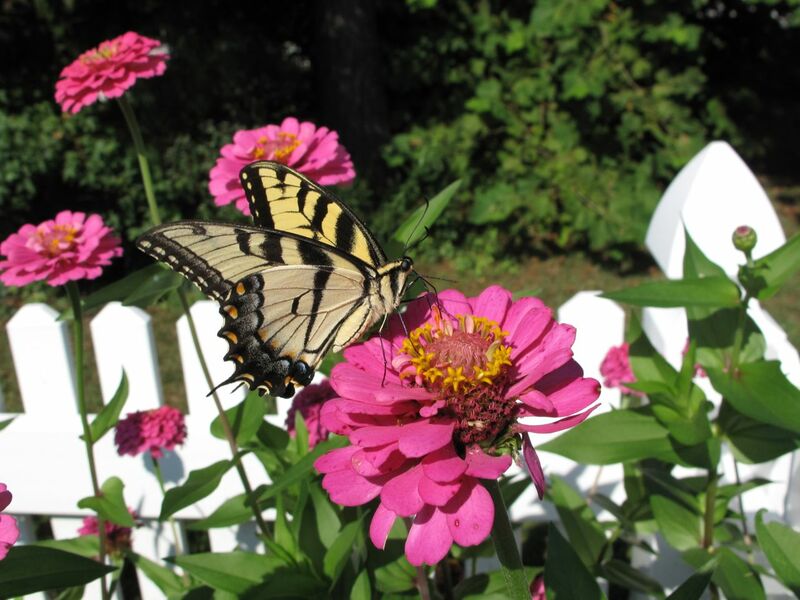 Zinnias in the northwest corner continue to attract butterflies. A white bearded Iris rebloomed this week bringing an unexpected treat. Irish Eyes shine against the day’s deep blue morning sky. 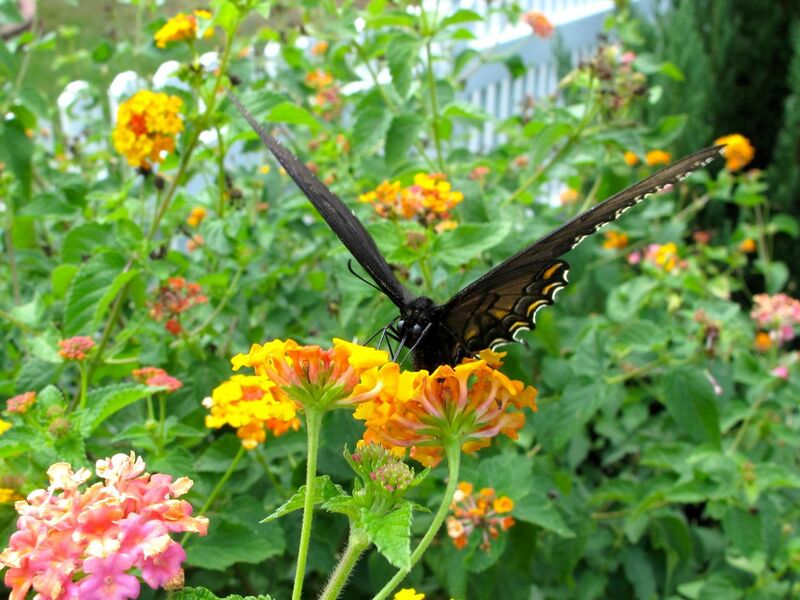 This entry was posted in garden and tagged Eastern Tiger Swallowtail (Papilio glaucus), Rudbeckia hirta 'Irish Eyes', skipper, zinnia on August 24, 2013 by pbmgarden. 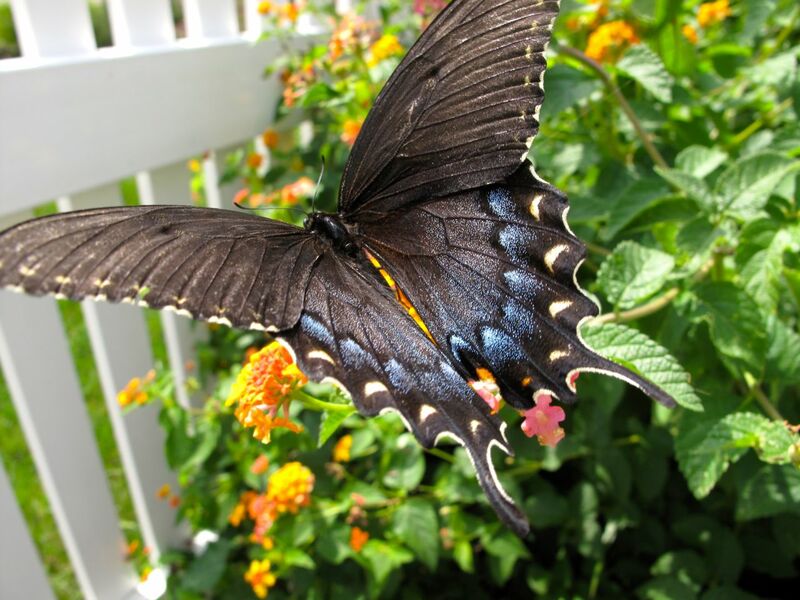 In trying to precisely identify this swallowtail, I discovered my state of North Carolina selected the Eastern Tiger Swallowtail (Papilio glaucus) as its official state butterfly in mid-June of 2012. After such a rancorous session, who knew what the legislature was really up to? I will not comment on the livermush part of the bill. 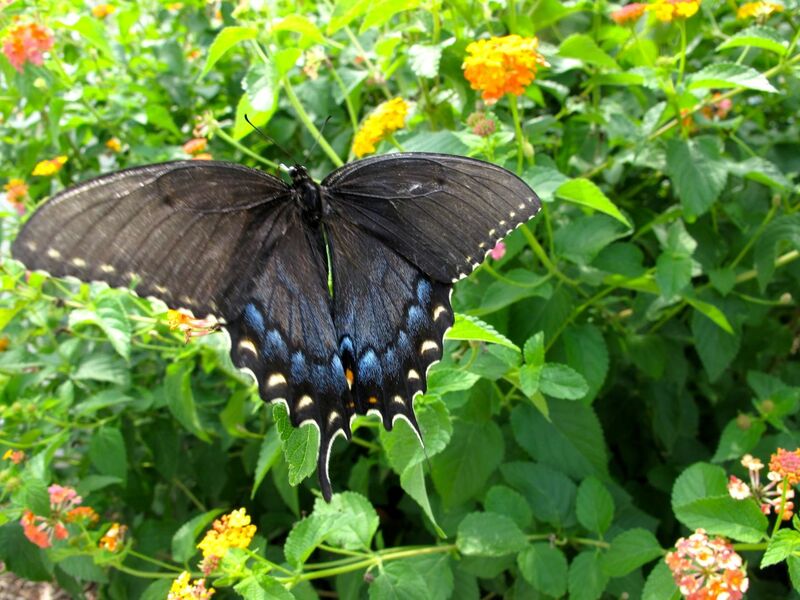 This North American native butterfly species is quite commonly found across the entire eastern United States. 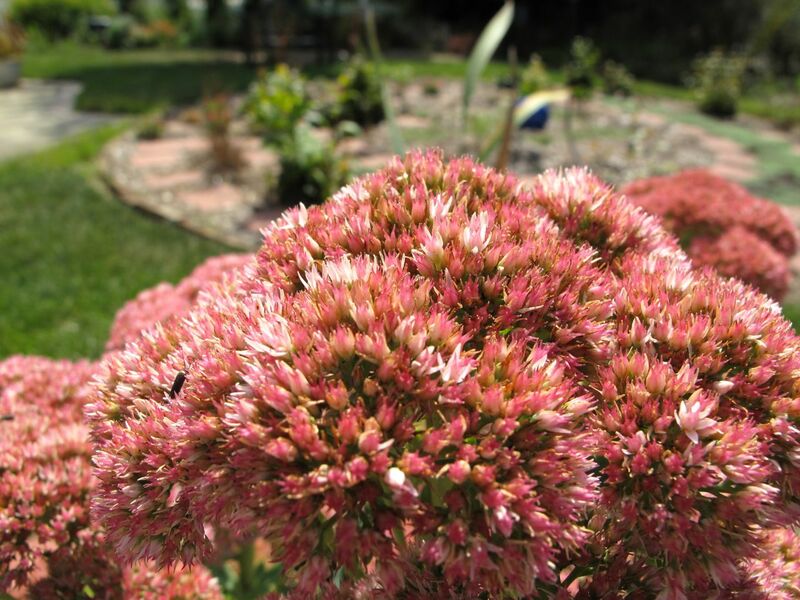 It has adapted to many host plants and to a wide range of habitats, including, of course, gardens. 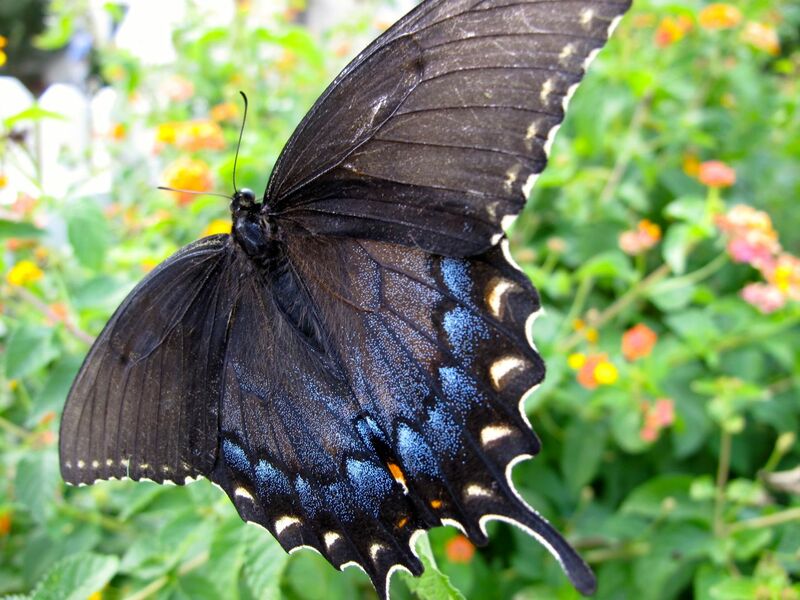 There are many interesting things to know about these butterflies. Males are usually yellow. 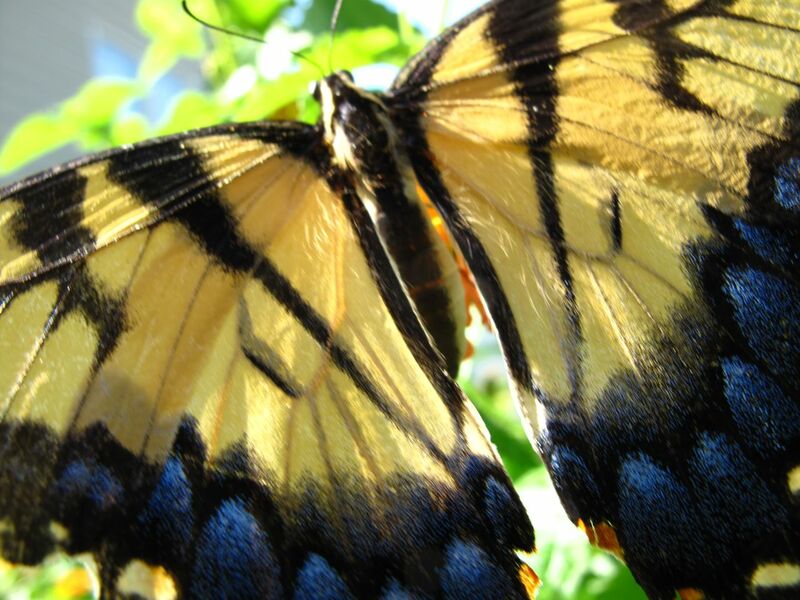 Females are dimorphic and can be yellow or black. 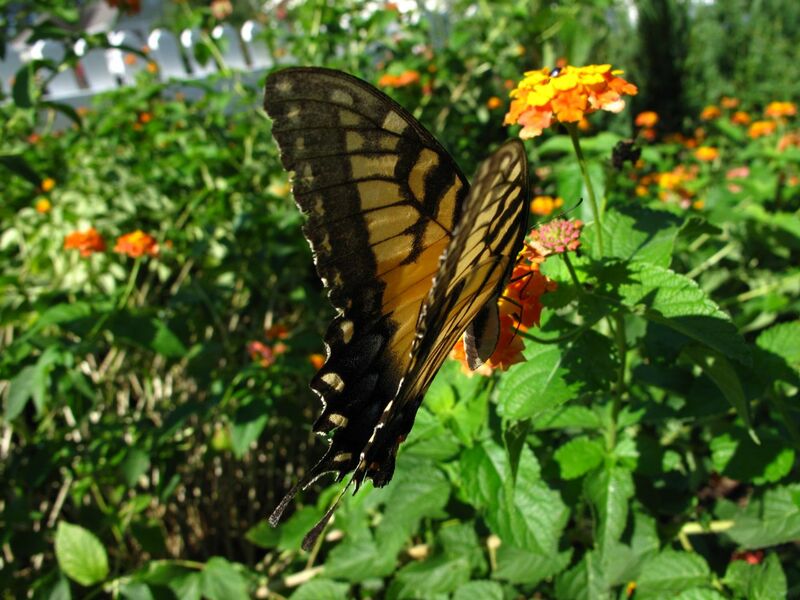 When the female is yellow, its upper hindwing is more bluish (so I assume this is a female). 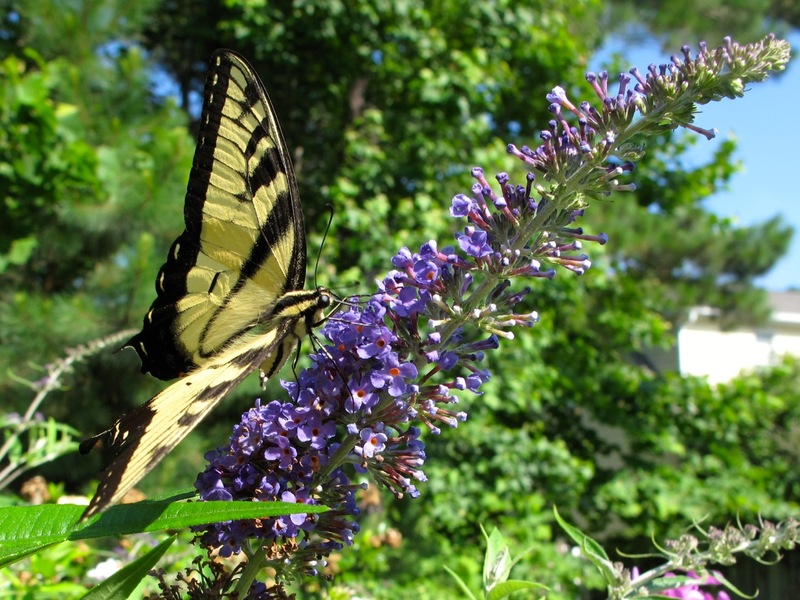 In this garden yesterday the native Eastern Tiger Swallowtail was attracted to a non-native plant. 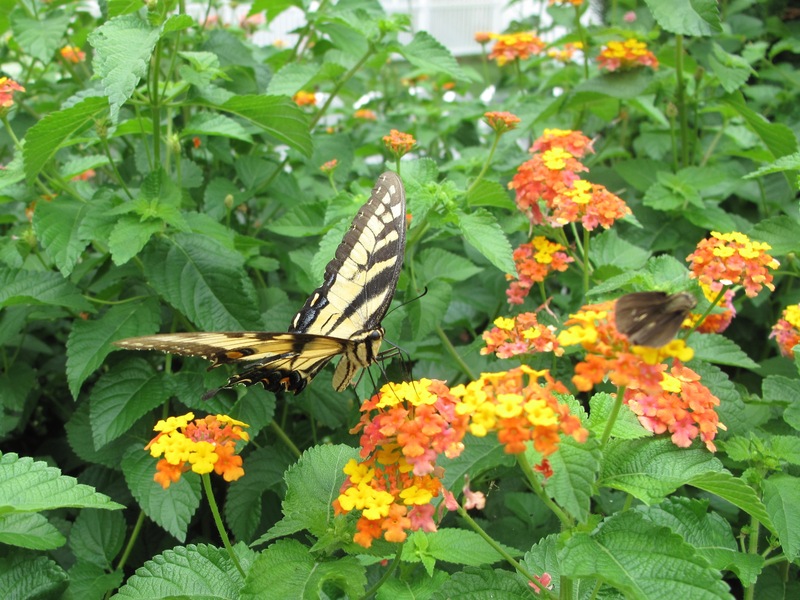 It fed on the nectar of Lantana camera. 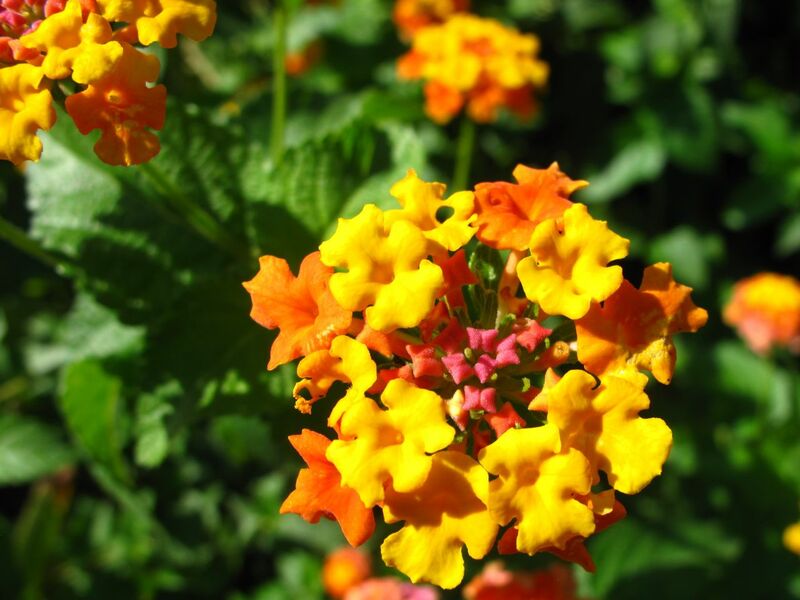 Though reported to be drought-tolerant, a few weeks ago this lantana appeared to be completely dried up. Since then there have been fierce storms, intense days of triple-digit heat and more storms. Though sprawled and splayed after such abuse this shrub is rallying with bright, cheery flower clusters of red, pink, orange and yellow. 1. Michelle Czaikowski Underhill (2012). 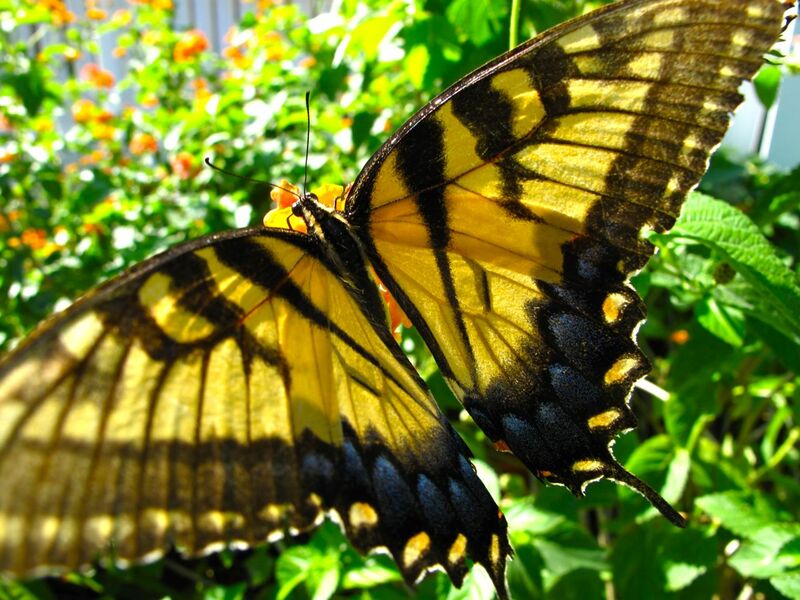 “Eastern tiger swallowtail” . NCPedia. Retrieved July 28, 2012. 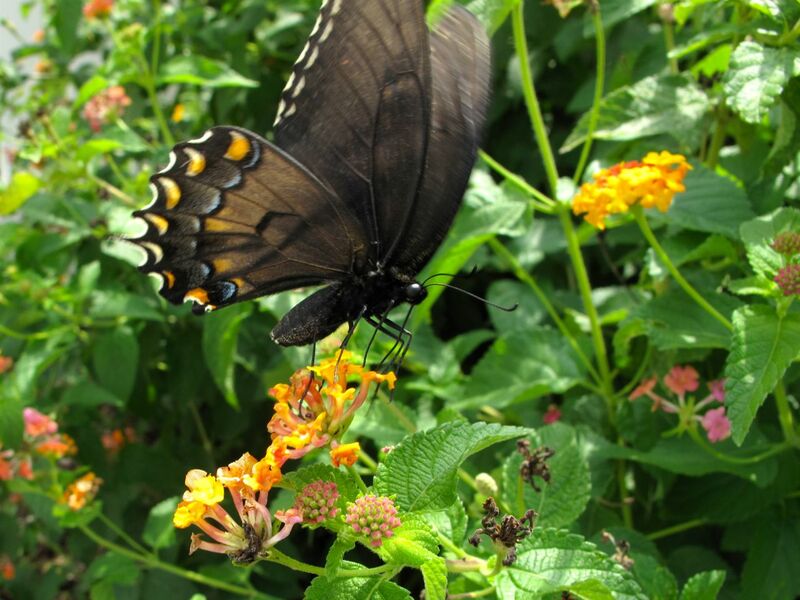 This entry was posted in garden and tagged almanac, Eastern Tiger Swallowtail (Papilio glaucus), Lantana camera on July 28, 2012 by pbmgarden.